I constructed my first plague doctor mask in 2010 after several requests, and I made it as historically accurate as I could. I had already made several steampunk masks and helmets, as well as a top hat and a raygun, and while I was working on the plague doctor mask I kept thinking about how I could make a very nice steampunked version of a plague doctor mask, combining the two elements. A week after it was finished I created Dr. Beulenpest, a steampunk plague doctor mask. It took me only five days. A year or so later I made Ichabod. 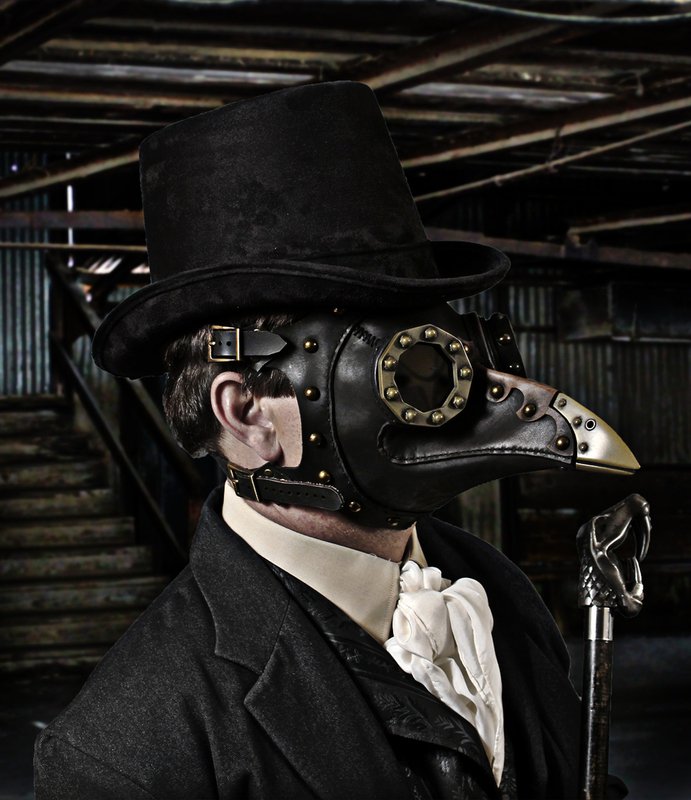 I had spent a lot of time studying Dr. Beulenpest and thinking about another version of a steampunk plague doctor mask. I decided to make a longer, slimmer beak with a larger cold cast tip. The aluminum parts have a relief pattern of stylized vines, and I reduced the number of straps from five to three to make it easier to put on and off. It took eleven weeks to complete. Once the beak was complete I sculpted the mask in clay and drafted the leather patterns. Getting the correct length and angle of the leather beak proved challenging. I photographed the sculpture from a side view, and scanned it into Photoshop where I tweaked those two components into about a dozen versions. Again, it just wasn’t coming together easily, but I finally chose my favorite and made the pattern. Finally I made the eyes. I had wanted to make domed acrylic eyes, and I did a lot of work towards that until I realized that the lenses would be susceptible to scratching, and I was faced with either building a protective cage around it, or doing something different. I agonized over this for weeks. Eventually I settled on two different versions of eyepieces. One would keep the dome but eliminate the acrylic lenses, opting instead for a cold cast cage which could be looked through. The other—for those who didn’t want to be seen—was flat gray acrylic lenses encompassed in new hexagonal lens caps. It took about a year and a half to complete Miasma. As a young man I had little patience. Now I find that without patience I wouldn't be able to create work that I am proud of. I started with the classic leather plague doctor mask and added cold cast aluminum eyepieces and beak tip. I put decorative domed rivets around the perimeter, and an interesting piece of trim leather down the bridge of the nose. I thought it came out nice, and it has sold well ever since. Three years later I started on another steampunk plague doctor mask. I felt that a third mask would round out the line, and that I could make one with a more masculine cold cast beak. I named it Miasma. I wanted a strong raptor, or dragon, look. I began three or four times to fashion the beak to my liking, but it always fell short, and I would put the project off to another time. After about a year of this I finally created a beak that I liked. It combined the look of a fierce dragon with that of steel machinery, like a living breathing fantasy piece of steampunk equipment.